A tall man sat cross-legged on the floor by the sliding doors of the Ring Bahn, the train that runs frenetic loops above the crowded heart of Berlin. He was not a young man, not quite middle-aged either. Heavily intoxicated, he was probably heading home after a long night partying along the Spree, or cruising the bars around Kreuzberg or Mitte. Places with perfumy concoctions in chilled copper cups or more illicit offerings between the cracks of crumbling buildings. How would he feel to finally make it home? Safe inside where no one could judge him. Perhaps he would exhale deeply and immediately heave his guts into the toilet. Or pass out fully clothed on top of his bed covers, if he had any at all, maybe just a naked mattress on the floor, and not an apartment, just a room. Was he on speaking terms with his mother? What exactly went wrong and when? When did it all go wrong? It had been some time, I could tell. Most of the passengers kept a wary distance from him, except for one, a chic older lady who stood a little too close. She calmly watched over him, his stone angel, silvery hair flowing down the sides of her solemn face. She looked strong, an impression asserted by her rigid posture, dark shades á la Karl Lagerfeld, patent leather gloves and a fitted black jacket. Her lipstick was a bold candy apple red. She could have been his cool mom. Tough love was in order. He sensed her penetrating gaze and closed his eyes tighter, willing himself not to be conscious—of her, of the other passengers constantly shifting around him, eyeing him in varying degrees of unease and amusement. If I didn’t notice how heavily his limbs dragged, how thickly his tongue lolled as he talked to himself sporadically, it would be easy to assume he was one of many New Age enthusiasts, footloose and fancy-free in the city, simply meditating in the classic pose of the Buddha, and why not in the middle of a stressful commute? Our train car was full but not packed. The stark afternoon sun filled the cars with a white light. The skies had been recently cleared of rain clouds by icy winds. It was a relief to be fully enclosed within the warm moving compartment, to simply stare out at the expanse of urban sprawl passing by in full autumn splendor. Every stop brought in hordes of new people to replace the hordes exiting, the changing mix of passengers corresponding to each district like the distinct blocks of an intricate quilt, rearranging themselves in vivid color and pattern in real time: the hijabs of Neukölln, the hipsters of Kreuzberg, the fashionistas of Mitte, the kid-towing yuppies of Prenzlauer Berg, the tattooed of Wedding, the dyed hair of Marzahn. Have I lived long enough in Berlin to assign a story to every surface? Have I earned the right to know this place with a doubt? There is always something. Something that resists this—resists me—resists neat edges, straight lines, clean definitions. I can’t say that no one cared about the man on the floor, the silver-haired lady clearly did. I can’t assume that no one is ever surprised by anything here, though most are hardened, not easily perturbed; it’s just another day in a big city. Visitors from all over the world come here, lured by the raw industrial style, the beauty and openness of the Szeneviertels, artistic areas brimming with glamour and inspiration. Once enchanted, they subsequently find themselves repelled by the equally raw tones of its coarser residents, the panoply of expletives, gruffness and condescension, the notorious Servicewüste (literally “service desert”). The wind whipped fiercely through the doors, opened briefly at the next stop, it blew in a bearded man with an acoustic guitar. A disheveled brown sparrow, arriving from far away—from the age of Aquarius and flower children. The first chords sprang out suddenly and boldly, strummed on his strings, resolutely engulfing the car in a soulful rendition of Johnny Cash as we crossed forested Tiergarten gilded red gold by yellowing rays. “Love is a burning thing/ And it makes a fiery ring/ Bound by wild desire.” The song struck a well of melancholy, sung in the singular with a lone guitar. A pause clung to the ends of every word, weighing them down to darker unknowns. The silver-haired lady abruptly joined in the chorus, “I fell into a burning ring of fire/ I went down, down, down/ And the flames went higher/ And it burns, burns, burns/ The ring of fire.” The young man’s voice receded to bring her’s forward, her voice was clear as a whistle, hitting all the notes with steely precision. Walking in on this scene at the next stop, a young man with slicked-back hair and a long woolen coat stood stock still at the doors, something of a modern-day dandy, he soft footed into the impromptu concert as timid as a fawn, a bright tinge of alarm rising in his clean-shaven face. His large pale eyes were those of a creature caught in a snare, alert and apprehensive. Waiting for more predictable circumstances to return, or all hell to break loose. Not at all sure which one would emerge. This was the place he was in, whether he liked it or not was irrelevant. He scurried to a corner, managed with dignity intact, silent and transfixed. All color drained from the car as the song concluded, bleached by the light refracted through overhead archways, reflected from shiny buildings, strained through wrought-iron lacework and metal cupolas. Reduced to figments of a nervous man’s imagination—to filaments in a noir film of Berlin, flashing excessive graffiti on stately buildings aging gracefully, the wounds of war flaunted beside glass walls and steel towers, the playgrounds built on the corners where sharpshooters once stalked and bombs once fell. The hopefulness that lingers in relics of old factories quickly disintegrating back into the wild. The ghosts of the past amidst the living, neither shunned nor feared. The woman stopped singing as abruptly as she began. It was as if nothing had happened. Nothing extraordinary at all. The song ended. The train stopped. And the man on the floor got up clumsily and leapt, as swift as a gazelle, out of the open doors. He greeted someone on the platform with open arms and a lopsided smile. Wonderful. You’re quite a story teller. “Something that resists this—resists me—resists neat edges, straight lines, clean definitions.” So beautifully put. I always have a tendency to think I’ve come to know a place after awhile, but in between those crowded moments where it seems “as if nothing had happened,” there are the extraordinary ones that continue to surprise us if we keep our senses alert and minds curious. Thank you for your intriguing perspective on a busy city. You just threw a bright, shiny coin in my guitar case! Thanks so much for your kind words! It‘s so great to share these moments of pleasant surprise with readers like you! Thanks so much! I really love Berlin, I’ll never unravel it, it’s endlessly changing, but it feels so good to share my impressions here with you all! Thanks so much! This really happened to me in the train a week ago! It was so inspiring, especially because I had been trying to write about Berlin, the city I call home for some time, I am so happy to share it here with you! You are a fantastic writer. Never stop writing! I envy your astute observations. I tend to get in a crowded place and vanish into either myself or some interactive moment (which could be individually or collectively if I can get enough people around me to engage) and then notice nothing of my actual environment. You noticed EVERYTHING! Absolutely brilliant. Yes, to me, you have earned the right to know this place beyond a doubt. Thanks again for another amazing comment! And also for the retweet! This is embarrassing to admit, but I don’t get a chance to go out much! I have two kids under the age of five, so I rarely get to go out and feel city life these days! So my eyes and ears are on high alert for any new stimulation when I do manage it! This is a real (surreal) train ride I experienced two days ago, I couldn’t help noticing all this and wanting to share it with everyone! Berlin is an incredible place in that it is more like a patchwork of neighborhoods which contain nearly all the necessities, so it is not necessary to own a car. That being said, daily life here is like living in a particularly cool village, that is until you board the subway or the many trains that are constantly moving and channeling people with great efficiency. It is then in one of those trains that the feeling really hits you: You live in a big, modern city!! It’s a great feeling to have such smart, knowledgeable, insightful readers like yourself to share these experiences with!!! Not embarrassing at all, you got your hands full! 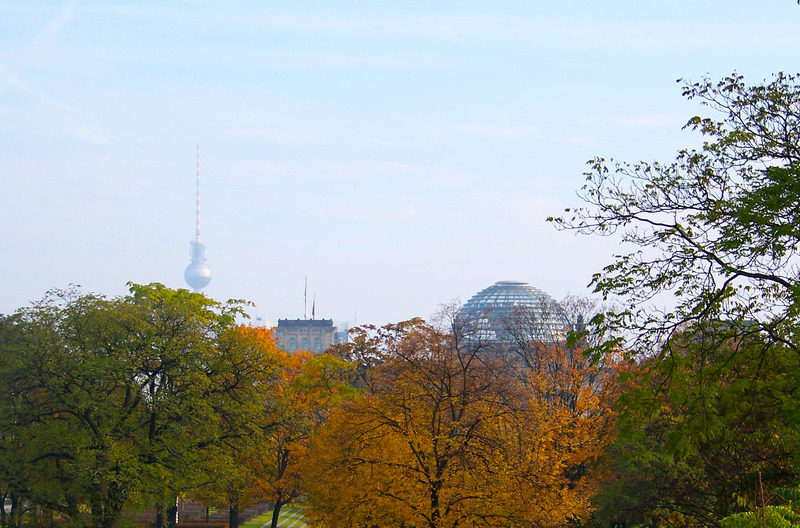 Your attention to detail, and your love of Berlin, come shining through. What an amazing commute you had that day!